Market Sentiment Watch: Lighter week on the economic data front. In energyland, we remain in the post 1Q16 reporting season lull (last week was much busier on the news front than expected) and we will continue to issue end of quarter wrap and cheats and Players updates and plan to do some minor portfolio modifications near term. We expect nothing concrete from next week's OPEC meeting and suggest that those who think something should have and subsequently speak of no cut disappointment are simply short. In today's post please find The Week That Was and a few other odds and ends. Friday 5/27: GDP revision, consumer sentiment. Click the link directly below this to ... .
Crude oil closed up3% last week at $47.75 (June contract) with the strip up 3% as well closing at $49.66. Please see The Wrap here for further pricing details and a large jump in net longs last week. Please see The Week That Was section below for additional comments. This morning crude is trading just under $48, down about $0.60 as the June contract takes over front month duty. OPEC Watch: OPEC's mid year meeting is next week, June 2. We and almost everyone else expect no change to production quotas. Iran Watch: Reuters story out noting Iran has no current plans to freeze production. It would be news if they did have a plan. Prior statements have pointed to no plans to curb exports until at least such time as they have attained pre sanction output. China Watch: China confirmed April imports were up 7.6% to ~ 8 mm bopd. YTD imports are running at record pace, up 11.8%. Analyst Watch: Morgan Stanley analysis indicates global oil discoveries in 2015 hit lowest level since 1952, noting total discoveries were 2.8 billion barrels which sounds like a lot until one considers that's about 1 month's demand. Natural gas was down 1% to close at $2.61 after the EIA announced another smaller than expected and smaller than average for this time of year injection. We see the ongoing erosion in the storage overhang as price supportive near term with a move higher expected as we move to mid year and early 3Q as traders weigh near or record then current gas storage vs the small sized injections (the heat of summer plus lower net imports) and a more normal looking winter post peak storage. See The Week That Was section below for additional comments. This morning gas is trading slightly higher on this week's hotter than normal forecast. Last week's weather: Population Weighed Cooling Degree Days were 15 vs 23 normal for this week of the year and 20 in the prior week. This week's forecast: HDDs are forecast to jump up to 39 vs 29 normal for this week of the year. Look for additional Players List updates. SLB (unowned) - Goldman adds to Conviction Buy list. This entry was posted on Monday, May 23rd, 2016 at 7:41 am	and is filed under Uncategorized. You can follow any responses to this entry through the RSS 2.0 feed. You can leave a response, or trackback from your own site. PDCE downgraded at Wells Fargo from Outperform to Market Perform, citing "increased regulatory risk". ETP: GS upgraded to Buy from Neutral. TP $40. Midstream name mentioned last week for those interested. re 1 – thanks, did not see but see it now. By same logic guess they should cut BCEI and SYRG. I think the concern is overblown. Nrgyman I missed your comments on Fri about RRC repurchasing bonds. Depending on whether the bonds are public or 144a they could do a tender offer to exchange some of them for common or common plus warrants. This creates the pressure to either remain with an uncertain albeit improved security or swap for more upside. If they are 144a, there are generally fewer holders thus individual negotiations may make more sense. Doing a public share offering and then using the proceeds is a more costly exercise as you are paying more commission to the IBs and improving the credit first through the sale of equity. In the past we've seen many variations of exchanges for bonds through a public offer and that equalized the availability to public holders. The key is creating a FOMO concern by the holders to encourage their accepting the deal. WTI set for 90 cents of profit taking at the open, on the Iran comments noted in the post. RE 4: Thanks Mark. If I understood Z correctly, he mentioned RRC could use the revolver to take in some debt (perhaps timely open market purchases) and then issue equity to pay off the revolver (including the balance inherited from MRD) and (possibly) provide growth capital. Nothing likely though until after the MRD deal closes. Would not surprise me to see RRC do something to reduce debt after the deal closes. FTI – TECF Trend toward improving offshore project economics could lead to further consolidation. (SLB – CAM) Offshore looking to lower costs and service companies looking to fill in portfolio gaps. JV's also a way to go. re 7 – I was referring to MRD's putable bonds, that they would use the revolver if needed to absorb some of those. Fairly light volume profit taking in the group in progress, pretty orderly looking, no sense of panic. Here, working though some numbers, shout if you need something. e 16 – yep, exports from the south down was news this am. Reuters reporting Genscape Cushing down 1m in wk to May 20th. Cheap gas = strong to record driving this Memorial Day. Not shocking. re 18 – thanks – given travel time we should start to see imports more impacted this week by Canada. It's the Cushing Genscape comment lifting crude back up this morning. It seems Genscape is making those numbers public more consistently now. FSLR: trying to elevate from the near-term bottom. TAN doing the same. Sector poised for an oversold bounce. Nrgyman…i'm in and loaded….ready for take off. please guide me how to access the ownership pie chart of the Z holdings. Z -Best possible scenario for Fort Mac and related is back to 100% by June 15th, not likely to pan out that way. Using a bar graph these days. re 30 – yeah, it's had a decent run, strong story that one, strong balance sheet to match and on the Shopping List. Do new methane capture regs have implications for more rapid buildout of gathering systems? re 32 – good question, but I think the answer is no. I spent a little time reading the proposals and it does not appear to be a lot of gas they are going after, not like a flaring situation but more tightening up of the system. It's not really my area but I get the sense that the volumes would be incremental only. Story about glut of oil in Singapore from reuters: Looks like the tankers in the picture are floating high in the water ? ECR – recent trading add, forming cup and handle nicely, expecting nice 2H16 move with better natural gas pricing. Recall this is gassy and our review at the time of the IPO noted it had some very "funky multiples" back in June 2014.
re 34 – thanks, been seeing those tanker queue pics with regard to Asia for weeks now, no idea if the photos are current or file. RE 24: SLCA upgraded at RBC to Outperform. PT raised to $33. CLB: Pulled back post equity offering, filled a closing gap from April 18 and now bouncing from chart support area. Z, if crude and natgas are likely to see H2 price advances the highest beta sector to play is the oil service names (though the natgas names could give them a challenge, depending on the weather). Your thoughts on adding to service names? SLCA, CLB, HAL and possibly RES all look strong. re 40 – we own HAL. We are watching RES. Have not done the work on SLCA to see if valuation is warranted in my view. Re41- is their a nutshell on RES ? This is one of the Service names we noted the other day we plan to watch now and get to know better again as we look for signs of a turn in pressure pumping and other services in North America. We do NOT own the name at this time. As a reminder, we expect the decline in the North American rig count to slow this quarter (calendar 2Q16). We also expect pressure on service prices to slow as well and we expect E&P capital budgets, which have been revised sharply lower since last fall 2015 for 2016, to shallow out and not decline much at all from their 4Q15 press release levels to the current 1Q16 release season. So, while we're not looking for a big rebound in the broad range of services that RES provides near term we are looking for key factors for their business to stop worsening. As a reminder, they are a debt free name highly focused on completions activity. They had pointed to their thoughts of positive EBITDA on the last call so that's a miss but the Street was expecting an even worse quarter. Technical services revenue (the largest piece of which is pressure pumping) was down 30% sequentially vs the 28% drop in the 1Q16 rig count. This is pretty much in line and it's not going to be perfectly lined up on a quarterly basis but it does point to perhaps an inability to improve service intensity, something they have highlighted over the last year, during the quarter. Will need addressing on the call. SG&A costs up YoY but by only $1.1 mm (2.6%) in part due to higher bad debt expense with lower head count having driven SG&A down in recent quarters. The bad debt expense will need color on the call but we do note further decline in accounts receivable: was $175.5 mm at quarter end vs $232.2 mm at year end (see cash build below). Debt: No debt. Liquidity should be $233 mm. Capex: Minimal capex budget maintain (prior estimate was $60 mm and they spent $9.3 mm in the quarter); this is down from $167 mm in 2015. Nutshell: Not a bad quarter all things considered. Miss on the top line and beats at the bottom. We're most interested in listening to them speak to the current environment and their view of the back half of the year. We may take a Starter Core position near term. Z, when you have time, a quick nutshell on GST would be useful. Adding to 50, it seems early for them in terms of activity and management was pretty far from pointing to a light at the end of the tunnel with the 1Q16 call. re 46 – Apologies, I'm not following the name, would have to do a full workup there. Can do but it'll be a couple of weeks out given our end of quarter update burden. re45 Thanks, sounds like it will be a winner in the future. re 49 – agreed, just no rush my view, may miss the early extension, hard to tell with service at the turns in my view. We stay long HAL to force me to pay some attention to that group and I monitor the rigs and what the upstream guys are saying. So far it appears stabilization of pricing is near but no tightness to drive them higher yet. Same really for activity. Balance sheet best prepared among their peer names with RES. re 48 – no problem, no need to add it to your list of to dos. re 51 – happy to do it, may take an hour, may take a day, just don't know until I get into it, lot of changes as I loosely understand what it is they now are. Will do. re 51 – no, thx anyway. If you ever do a comparison chart of the STACK/SCOOP players maybe you could include them, but not requesting that, and I wouldn't want you to do a special workup on them. re 53 – OK, thanks. Snagged some MRD at $14.71 see today it's trading over $15 anyone have feelings buy hold or sell? Just bought it for a short term trade. I understand this is not what Z does but have been following RB and it has worked out. Sitting in doctor's office at Mayo Clinic and have my fingers crossed that all is OK. But being a guy all I think about is money. re 55 – we are holding it long term and through the completion of the merger along with our larger holdings in RRC. 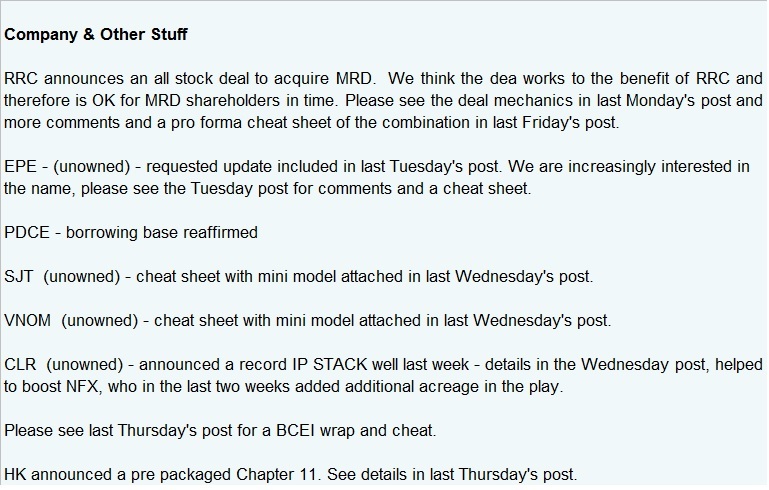 We had comments on the deal in last Monday's post along with a pro forma Newco cheat sheet in last Friday's post. Best of luck at Mayo. Adding to 56 – depending on how short term you mean, we are looking for a leg up in all of our gassy names relative to 1H pricing in 3Q which is just around the corner. re:55…I suggested that there was no hurry to buy MRD when Z took his position. I thought the move was already near overbought and that a pullback would provide a better entry. Obviously, that wasn't what happened. MRD got a takeout offer and anyone that listened to me would have missed the takeout. All that said, if I'd bought MRD, as a trade, and didn't want to hold the acquirer for an intermediate hold or longer, I'd turn the shares to cash and look for an entry on something else. re 58 – thanks, makes sense. re: 57…in my trading acct. I'm holding XOP/CXO/FANG…..I have cores in most of the ZLT that I don't trade. I'm trying to add a trading position in CPE on a pullback. My order is in at 10.93; but I have a much bigger order at 10.11 that I don't expect will fill unless we get a big, big red day in the markets and in energy in particular. Been out a week and am putting my forward trading strategy back together. May take several more days. I'm not as slow to move as Z, but I don't get in any rush either. things either pullback to a nice support or they don't. I don't chase them. Here is my chart on CPE. The 10.93 entry I'm looking for is two cents above the prior "pivot low"….the 10.11 entry is a dime above the lower "pivot low" at the bottom of the red rectangle I've drawn on the chart. I like the chart a lot….https://stockcharts.com/h-sc/ui?s=CPE&p=D&yr=0&mn=6&dy=3&id=p85000188653&a=447460707. I have a pretty good sized core position in CPE. So, if it doesn't pull back in, that's fine with me. But most of 'em breathe on their way up, so I like to capture a bit of that movement. re 61 – thanks, makes sense too. I rarely chase anything in energy as often you get another shot at it and I almost always DCA anyway. This was from earlier but worth noting, GS now sees oil prices in a range of $50 to $60 through 2020. We shall see but that's not a terrible price range for US shale in the good rock areas. Beerthirty, back in a bit. Good afternoon Zman. I saw in the "company and other stuff" box that HK announced a prepackage BK. what happens to the common? Thanks. The deal reduces total debt by $1.8 B to about $1 B and annual interest by $200 mm. The $200 mm in interesting savings will allow HK to return to a growth trajectory much more quickly than would have been possible with it siphoning off cash flow to be sure. Post restructuring we have about $1 B in debt on a company making, as planned for 2016, a mid point of 38,000 BOEpd (80% oil). If we take the 38,000 BOEpd mid point of 2016 guidance and value it at $35 per flowing BOE were arrive at a prospective TEV of $1.33 B. Subtracting debt from TEV and backing into the new shares puts us at $0.10. If you went with $50 per flowing BOE. That jumps up to $0.48 per share. Alternatively, on a 6x EBITDA multiple of expected 2017 EBITDA we arrive at $0.23 per share and an 8x multiple would take that to $0.41. Restructuring plans requires additional stakeholder approval. Equity holders generally totally get wiped out in Chapter 11 so almost surprised to see them come away with 4% of the company (which just happened to be what the market cap vs TEV was at the time of this announcement). Nutshell: Now we understand why HK didn't have a Q&A for the last two quarterly calls as this plan was well in progress by then. They did not need to do this, at least not yet given their hedges. They punted and hit the reset button. We do not plan to sell or add at this time. At the time of the announcement HK was a little over 2% of ZLT assets. PE – on the tape with Southern Delaware Basin mineral interest pickup, secondary, and notes placement, details in morning post. Sorry ZMAN, I just looked at the HK website and the existing common equity receives 4% of the pro forma equity. re 68 – yes, that's correct. Another record daily outflow from the biggest high-yield bond ETF, interest rate hike fears ? BCEI – borrowing base reduced to $200 mm resulting in deficiency of $88 mm. As of 3/31 they had $218 mm in cash. Re 72: Z, I'm trying to remember here.. BCEI drew down their line not too long ago (we speculated to give them more leverage with a future RMI sale) — is the $218mm cash on hand (partial) proceeds from the aforementioned line draw? They had $218 mm in cash as of 3/31/16, and likely have $206 mm at present so they could pay the deficiency and still fund this year's budget of $40 mm regardless of a monetization event (they're looking to do two this year). Options are: a) to repay deficiency in total within 30 days, b) pledge additional oil and gas properties (not an option for them), c) repay in 6 monthly installments 1/6th of the deficiency balance with the first payment due in 30 days (likely choice),or d) a combination of b and c.
Nutshell: Bigger than expected hit to the borrowing base and stock will come under pressure as they decide how to address the deficiency. This could make negotiations for the RMI midstream joint venture more difficult as any potential midstream player looks for assurances that BCEI will be able to expand volumes. This fear would be partially offset by higher oil prices that we have seen since the February price trough. Expect a negative reaction to the news today. RRC: Closes sale of 29.4% stake in Marcellus acreage (non-operated) for $112 million (Chaffee Corners JEA). Hadn't noticed this before. And is included in the pro forma balance sheet in last Friday's post. Smart move to take the minerals. Deets in the morning post. re 78 – priced at $24.60. That's a really good deal on the minerals.